The U.S. state of Alabama has 67 counties. Each county serves as the local level of government within its borders. The land enclosed by the present state borders was joined to the United States of America gradually. Following the American Revolutionary War, West Florida was ceded to Spain by treaty while the remainder was organized primarily as the Mississippi Territory, and later the Alabama Territory. The territorial assembly established some of the earliest county divisions that have survived to the present, including the earliest county formation, that of Washington County, created on June 4, 1800. In 1814, the Treaty of Fort Jackson opened the territory to American settlers, which in turn led to a more rapid rate of county creation. Alabama was admitted to the Union as the 22nd state in 1819. The Alabama state legislature formed additional counties from former native lands as the Indian Removal Act took effect and settlers populated different areas of Alabama. In 1820, Alabama had 29 counties. By 1830 there were 36 and Native Americans still occupied large areas of land in northeast and far western Alabama. By 1840, 49 counties had been created; 52 by 1850; 65 by 1870; and the present 67 counties by 1903. Houston County was the last county created in the state, on February 9, 1903. According to 2010 U. S. Census data, the average population of Alabama's 67 counties is 71,399, with Jefferson County as the most populous (658,466), and Greene County (9,045) the least. The average land area is 756 sq mi (1,958 km2). The largest county is Baldwin (1,590 sq mi, 4,118 km2) and the smallest is Etowah (535 sq mi, 1,386 km2). The Constitution of Alabama requires that any new county in Alabama cover at least 600 square miles (1,600 km2) in area, effectively limiting the creation of new counties in the state. Decatur County December 7, 1821 December 28, 1825 Commodore Stephen Decatur of the United States Navy. Created in 1822 with Woodville as its county seat. Abolished several years later, divided between Madison County and Jackson County. 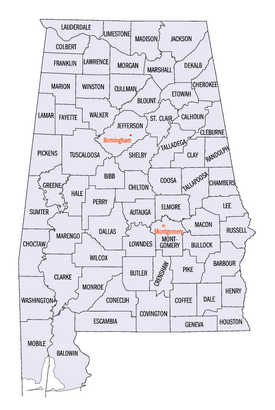 List of counties in Alabama Facts for Kids. Kiddle Encyclopedia.